Want to know the property rental yield of your investment property? This property rental yield calculator will calculate rental yield for you and allow you to compare rental yields across properties. In addition, a rental yield table based on different weekly rental incomes and property prices is included for your reference. The property rental yield is a very important performance indicator of property investment. To calculate rental yield, you just divide the gross annual rental income by the purchase price (or the current property value). In rough terms, if the rental yield is 2-3% higher than the current home loan interest rates, the property is likely to be a positive cashflow one otherwise a negative gearing one. Here is a rental yield calculation example: if a property with a purchase price of $300,000 is rented for $400 per week and 50 weeks per year, the rent yield is ($400×50)÷$300000 = 6.67%. 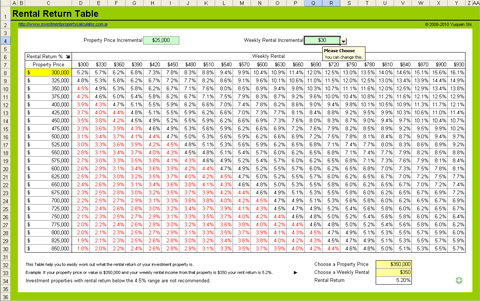 Here is a screen shot that will give you a better idea that what you need to do and what this free property rental yield calculator can tell you. You can use rental yields to compare and choose investment properties. For example, property 1 - with a purchase price of $300,000 is rented for $400 per week and 50 weeks per year VS property 2 - with a purchase price of $420,000 is rented for $500 per week and 49 weeks per year. The rent yield of property 1 is ($400×50)÷$300000 = 6.67%. The rent yield of property 2 is ($500×49)÷$420000 = 5.83%. Based on rental yield only, you should choose property 1 because its rental yield is higher. We suggest to use net rental yield when comparing investment properties because the gross rental yield does not consider the costs of maintaining an investment property. 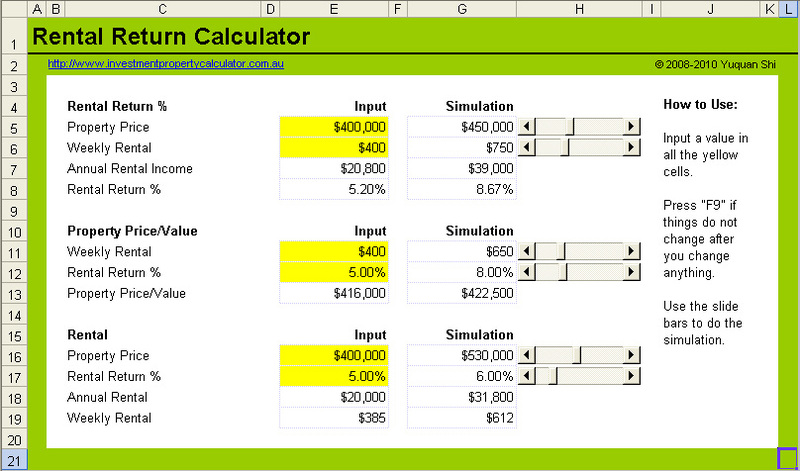 This free property rental yield calculator only calculate gross rental yield. If you want to calculate net rental yield, you should download the Free Investment Property Calculator. A more rigorous approach is to include the home loan interest as well when calculating rental yield. 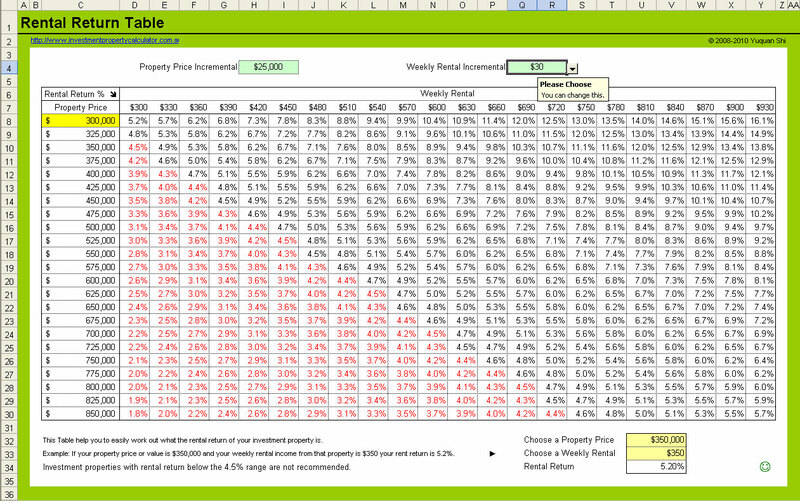 Download FREE Property Rental Yield Calculator Now!